As promised, here are some photos from the journey I made last weekend, from Highland Perthshire to Skye. 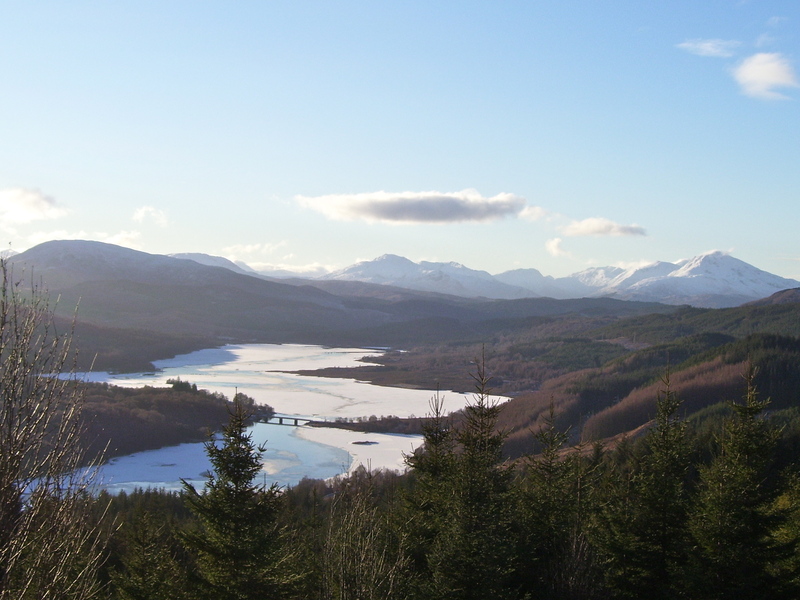 Strictly speaking, the Road to the Isles takes a different route, cutting across further south ‘by Tummel and Loch Rannoch and Lochaber’, as the old song goes. 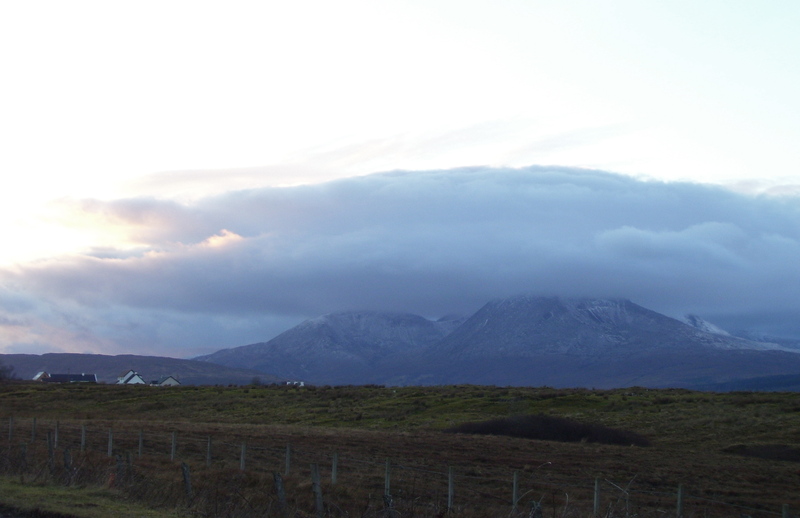 The destination is the same, however: the ‘far Coolins’ of Skye. Either route is jaw-droppingly beautiful, even to those of us lucky enough to have travelled them many times. 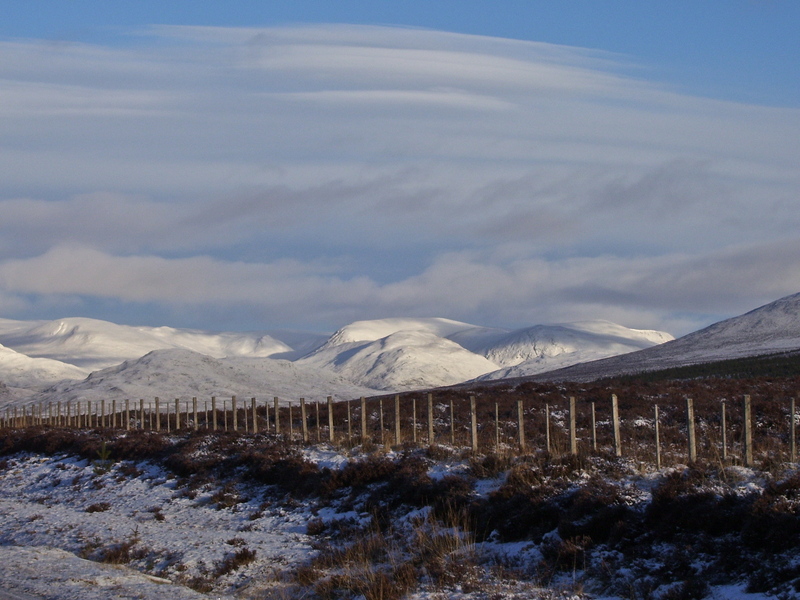 As you drive north and cross from Perthshire into Inverness-shire, the view to the east is dominated by the Cairngorms, or blue mountains, and to the west by the Monadhliaths, or grey mountains. At the moment, however, every hill in the Highlands is white. 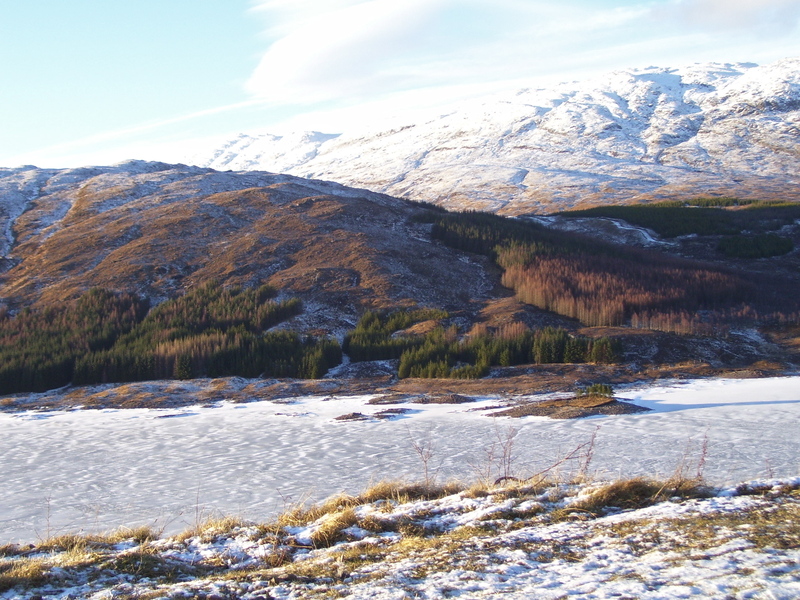 Near Ardverikie (where ‘Monarch of the Glen’ was filmed, if anyone remembers that series) I came across my first sight of a loch completely frozen over, looking more like a salt flat than a Scottish loch. For the rest of the day, every loch I drove past looked the same. In October, I thought that the autumn colours were unbeatable. The clear winter skies, though, give a brilliant clarity to the landscape. 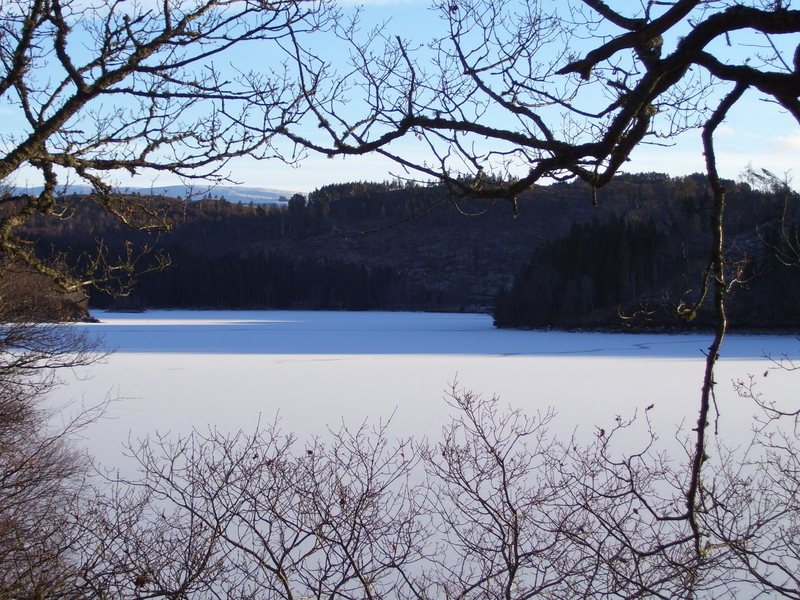 On this loch, the snow had frozen in wind-patterns on the ice, making it look as if it had frozen in mid-flow. Heading into Glen Shiel and the mountains of Kintail, I always feel that I have arrived in the West at last, the last leg of the journey to the coast. 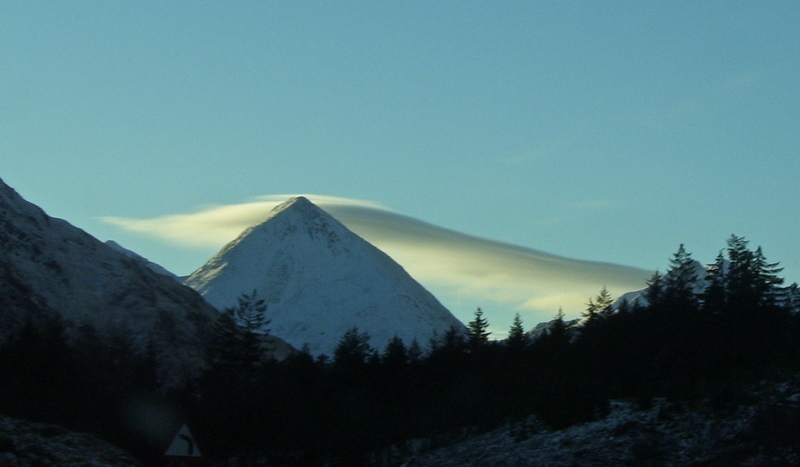 At the entrance to Glen Shiel is this extraordinary pyramid of a mountain. I don’t know its name but, being a chocoholic, I call it Mount Toblerone, for obvious reasons. On Friday, it had draped itself in a chiffon shawl. It looks like a child’s drawing of a mountain, doesn’t it? Incidentally, Glen Shiel has two claims to fame, apart from its archetypal Highland scenery of lochs, mountains and a castle. 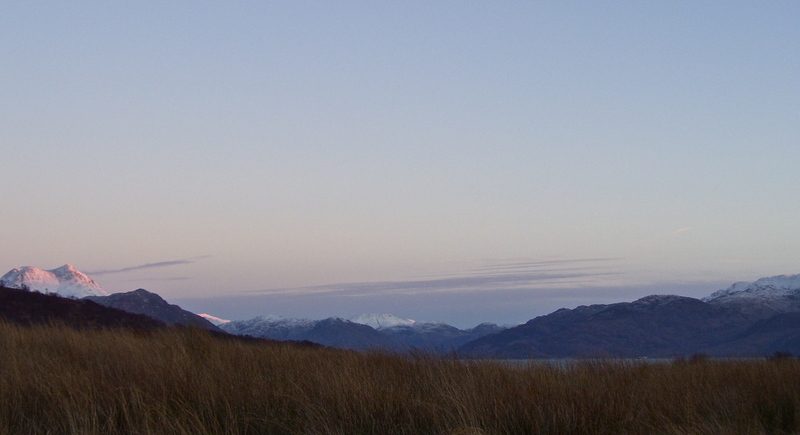 One is the Five Sisters of Kintail, a ridge walk of five linked peaks which is a favourite amongst hill-walkers. The other is that it is the site of the last battle on mainland British soil between foreign and government troops. In 1719 a Hanoverian government army defeated a Jacobite force who were boosted by Spanish troops. There is a little sign by the side of the road marking the battle, which gives the impression that it was fought in a lay-by. 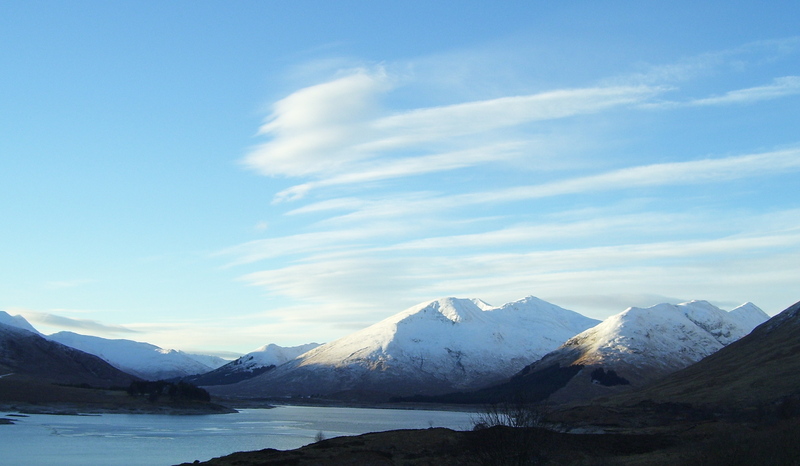 At the sea-ward end of Glen Shiel, you come out from the shadow of the Five Sisters to find yourself facing one of the most photographed castles in Scotland. Eilean Donan Castle looks as if it were designed for a film set, and indeed it has been used in several movies including ‘Highlander’, starring the extremely un-Highland-sounding Christophe Lambert, and, oh, one of Pierce Brosnan’s James Bond movies. (Before them, it was used with more serious purpose by those Jacobites and Spaniards.) Even in the flat light of a late winter afternoon, it’s just ridiculously picturesque. 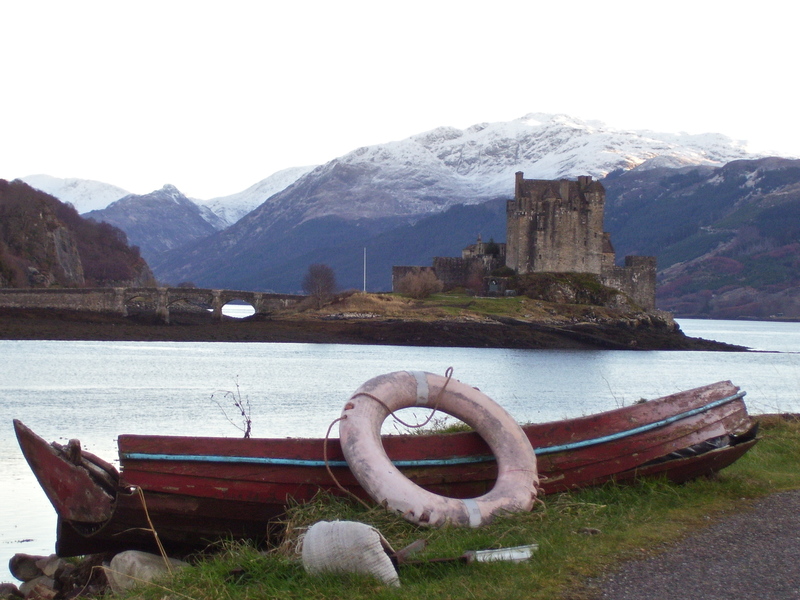 Eilean Donan is on Loch Duich, a sea loch. 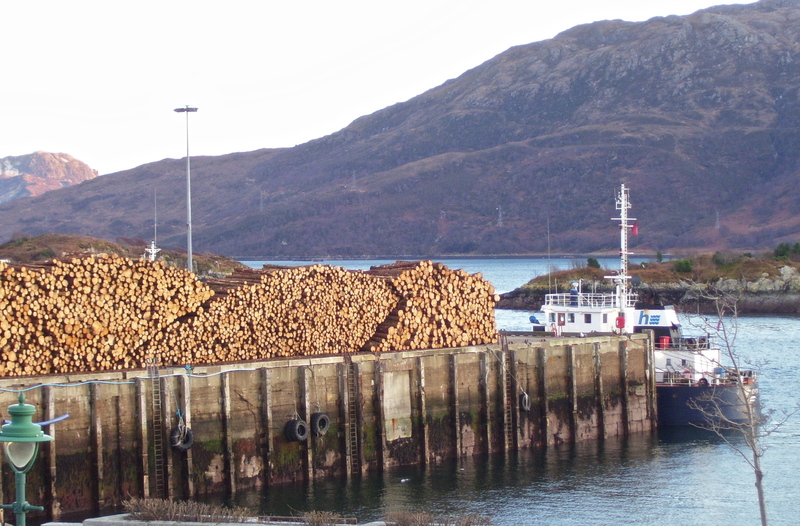 Within a few miles I was at Kyle of Lochalsh, the little seaport where the Skye bridge connects the mainland to a corner of the island. Here you can (in theory) get your first clear view of Skye, looking past the springing arch of the bridge to the island’s mountains beyond. On Friday, however, the island was living up to its alias of Eilean a’ Cheo, or island of mist. 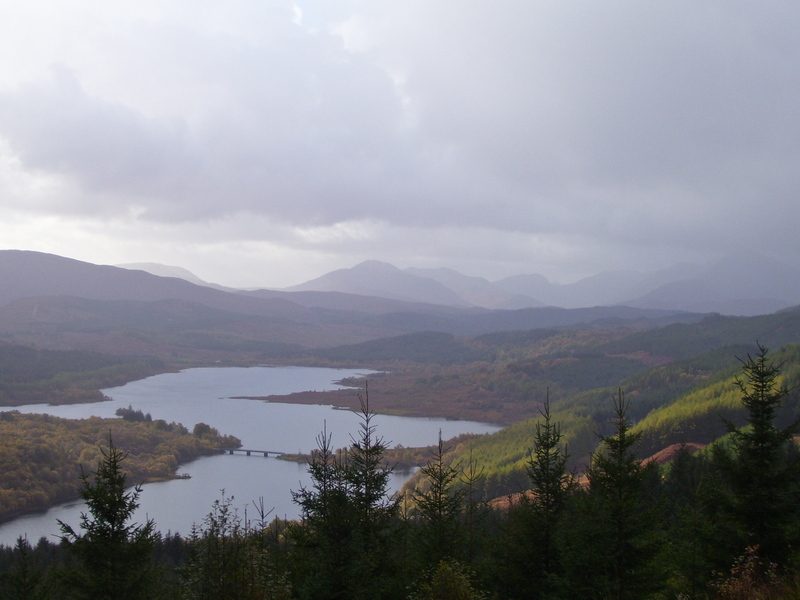 The drive through the Highlands had been mostly under a hard blue sky and bright sun: looking out from the Kyle, I saw that the islands were half-hidden under a great brooding bank of snow clouds. 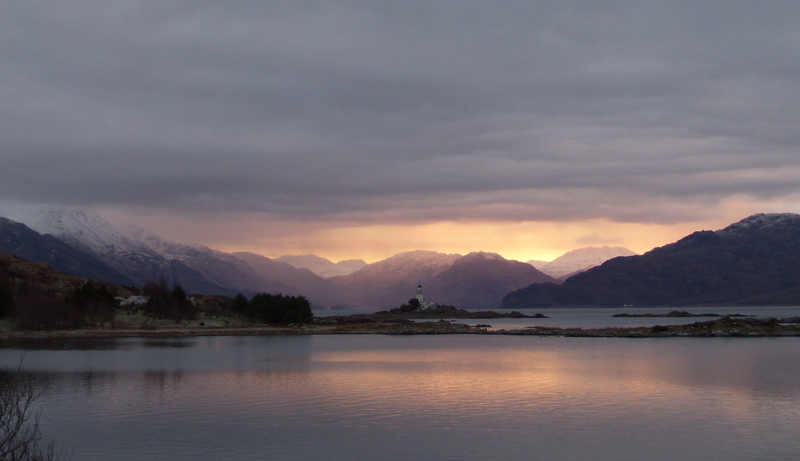 To me, though, it is a pleasure to be on Skye in any weather. 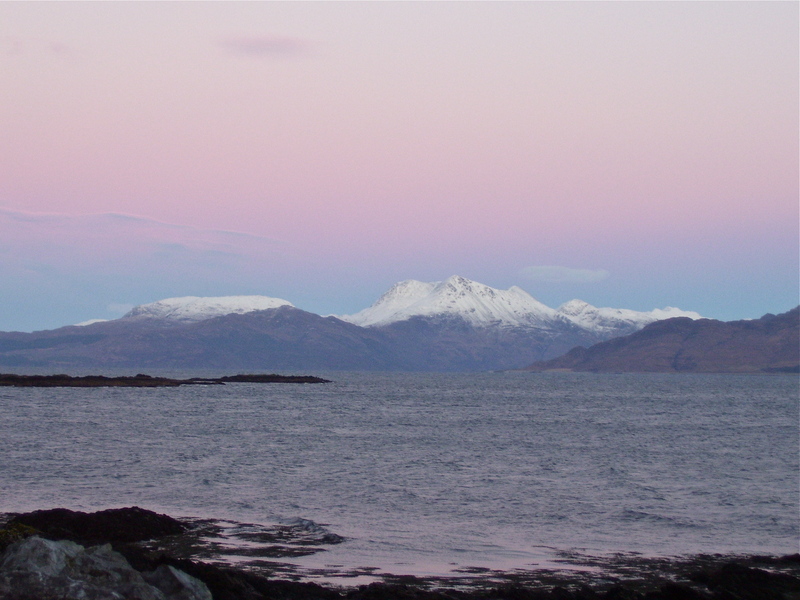 I drove along the Sleat peninsula, the long finger of land which forms the base of the island, watching the clouds turning to blazing orange over the Cuillins and the snowy mountains of Kintail and Knoydart turn pink in the sunset. These delicate colours and snowy peaks made me think incongruously of Japanese silk-screen paintings. As the light failed, I turned towards my home for the weekend, the little island-off-the-island that is Eilean Iarmain or Isle Ornsay. It is one my favourite places in the world. From a friend who lives there, I have learned a line of poetry which perfectly sums up how one feels, arriving after a long journey in this little piece of paradise. Stunning, breathtaking images, on this and your last post. I don’t think I would find January half as bleak if I had these sorts of landscapes to look at, lucky you! Really, really beautiful. What an unbelievably stunning journey! Scotland is such an incredibly beautiful country! I especially love your “Mt Toblerone” shot. Good name for it. Beautiful, especially the last photo. Happy New Year by the way! Thank you again Beastie, for a visual feast. As I waited for the pictures to download I recalled the tune and the words of Road to the Isles and decided the tune was far too cheery for the lovely, brooding pictures of winter in the north. Going to be present at the burial of a longtime friend is conducive to contemplation, and you were carrying more than “the sunlight for my load” as the song says. We must all stay warm and stay comfortable and wait it out until spring! Thanks for the gorgeous photos and terrific memories they evoke for us. The Highlands are definitely on our list to revisit someday. Absolutely breathtaking; thank you, as I’ll never get there. No wonder my Brother visited six times! Thanks, everyone, for your comments. It’s a pleasure to share such beauty. Who needs the Alps in winter? Thanks for your comment on my blog, and likewise, it’s nice to discover another Scottish blogger. Looking at these images, one might think everyone had left the country. And wonder, why?! Aren’t the Highlands empty because of the clearances, with sheep put there to replace the people? I read something about that a few years ago. Many Americans probably would still be there if that had not happened. My own ancestor left when he was 15 or 16, five years after the clearances. I feel drawn to that lovely place, and feel that it has such a mysterious hold on people, including those who have never been there. I love Scottish music and maybe someday will be able to see the country. Hello Linda, thanks for visiting. These connections are a perfect demonstration of why the internet is called a ‘web’, aren’t they! Beautiful pictures! Thanks for those. 🙂 It’s so hot here in Sydney, nice to see pictures from somewhere cooler. So gorgeous! We keep saying we are going to take trips out of Aberdeen once the spring arrives (we’ve no car, so we try to plan for times when we won’t get stuck in some lonely place in the dark with no transport home, as has happened a few times in the past) but everything looks so lovely in these photos, I really wouldn’t want to miss the winter. At least the days are starting to get looooonger now. Thanks for the good motivation and lovely sights! Just to say i followed the link from your post today about Skye, DB, and all I can say is Wow! 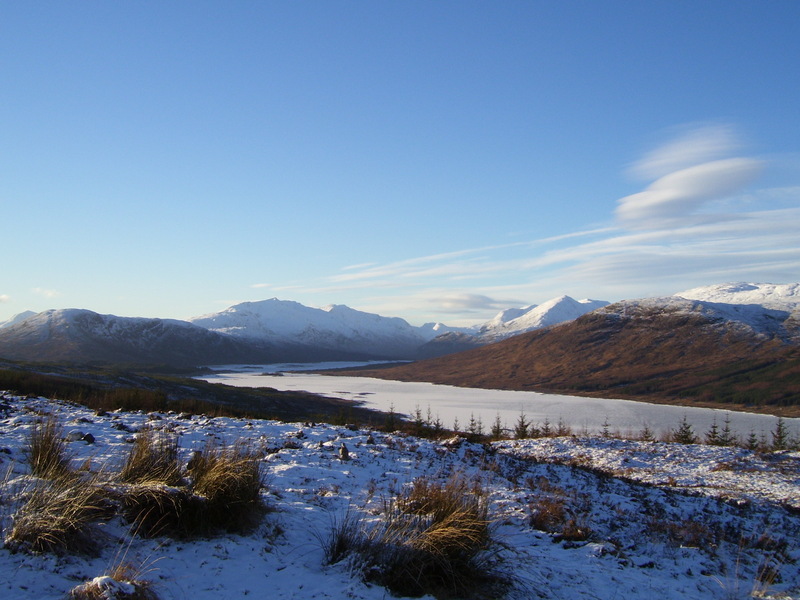 Fantastic photos of scenery which is now lodged in our hearts also after our visits to the North of Scotland. Oh, it’s nice to know that you followed a link, thank you! This January trip was certainly the most taxing I’ve done, for many reasons, but indisputably the most extraordinarily beautiful of my many journeys to Skye.